This article outlines an example of a Letter of Intent (LOI). A Letter of Intent (LOI) is a short non-binding contract that precedes a binding agreement, such as a share purchase agreement or asset purchase agreement (definitive agreementsDefinitive Purchase AgreementA Definitive Purchase Agreement (DPA) is a legal document that records the terms and conditions between two companies that enter into an agreement for a merger, acquisition, divestiture, joint venture or some form of strategic alliance. It is a mutually binding contract). There are some provisions, however, that are binding such as non-disclosure, exclusivity, and governing law. Letters of intent are often produced by investment bankersInvestment Banking Career PathInvestment banking career guide - plan your IB career path. Learn about investment banking salaries, how to get hired, and what to do after a career in IB. The investment banking division (IBD) helps governments, corporations, and institutions raise capital and complete mergers and acquisitions (M&A). Analysts work 100 on behalf of corporate issuersCorporate InformationLegal corporate information about Corporate Finance Institute (CFI). This page contains important legal information about CFI including registered address, tax number, business number, certificate of incorporation, company name, trademarks, legal counsel and accountant.. Below is an example of an LOI template. Download the free Word Doc template now to produce your personalized document! Note: This Letter of Intent (LOI) template is only for educational purposes and should not be used for any other purpose. We are writing to provide a letter of intent from OUR NAME Inc. (“Shorter Name”) in respect of a transactionDeals & TransactionsResources and guide to understanding deals and transactions in investment banking, corporate development, and other areas of corporate finance. Download templates, read examples and learn about how deals are structured. Non-disclosure agreements, share purchase agreements, asset purchases, and more M&A resources (a “Transaction”) with TARGET NAME Inc. (“TARGET NAME” or the “Company”). We appreciate the time and energy you and your team have afforded us in discussing this opportunity and the information that has been provided thus far. 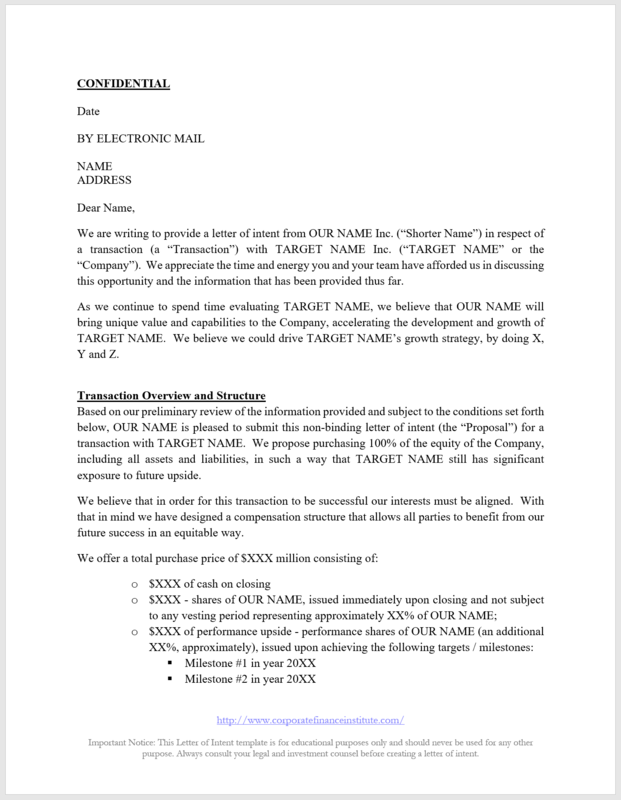 As we continue to spend time evaluating TARGET NAME, we believe that OUR NAME will bring unique value and capabilities to the Company, accelerating the development and growth of TARGET NAME. We believe we could drive TARGET NAME’s growth strategy, by doing X, Y and Z. Based on our preliminary review of the information provided and subject to the conditions set forth below, OUR NAME is pleased to submit this non-binding letter of intent (the “Proposal”) for a transaction with TARGET NAME. We propose purchasing 100% of the equityStockholders EquityStockholders Equity (also known as Shareholders Equity) is an account on a company's balance sheet that consists of share capital plus retained earnings. It also represents the residual value of assets minus liabilities. By rearranging the original accounting equation, we get Stockholders Equity = Assets – Liabilities of the Company, including all assets and liabilities, in such a way that TARGET NAME still has significant exposure to future upside. We believe that in order for this transaction to be successful our interests must be aligned. With that in mind, we have designed a compensation structure that allows all parties to benefit from our future success in an equitable way. The final purchase price will be adjusted for customary changes in net working capitalFinancial Modeling Working Capital which will be reflected in the cash component of the purchase price. This Transaction is of the highest priority for us, and we are prepared to proceed as quickly as possible; it is important that you make that same commitment to us before we expend additional time and resources pursuing this opportunity. OUR NAME has developed an investment thesis and an understanding of the business through our initial due diligence, including several conversations with management as well as a preliminary data review. We envision our remaining due diligenceDue DiligenceDue diligence is a process of verification, investigation, or audit of a potential deal or investment opportunity to confirm all facts, financial information, and to verify anything else that was brought up during an M&A deal or investment process. Due diligence is completed before a deal closes would include, but would not be limited to, commercial, accounting and financial due diligence, as well as customary legal, tax and regulatory work. With the Company’s full cooperation, we believe we can expeditiously complete our due diligence, and present TARGET NAME with a definitive agreement within eight weeks from the date our Proposal is accepted. If the Company is interested in pursuing the proposed Transaction, we would require sixty days of exclusivity (the “Exclusivity Period”) to finalize our due diligence and negotiate definitive documentation, subject to a 60-day extension if OUR NAME is working in good faith to consummate the transaction at the initial expiration date. In light of our Proposal’s premium valuation, we believe that granting exclusivity at this stage will benefit the Project and its Shareholders. In order to complete our due diligence and to secure the additional requisite capital, we will need reasonable access to Company information and the ability to share that information with our prospective equity partners and debt financing sources in a manner that protects the confidentiality of your information and our discussions. A draft form of the exclusivity and confidentiality agreementConfidentiality Agreements in Investment BankingWhy banks try to avoid Confidentiality Agreements. Whenever possible, investment bankers should avoid entering into a confidentiality agreement as a condition of receiving confidential information, particularly prior to obtaining a signed engagement letter. is enclosed as Exhibit A for your consideration (the “Exclusivity and Confidentiality Agreement”). We emphasize our desire to complete the proposed Transaction in an expeditious and efficient manner and our readiness to mobilize resources to move ahead quickly. To that end, and assuming we sign this letter in advance, we would suggest an organizational meeting as soon as possible to agree on the work plan during the Exclusivity Period. This non-binding indication of interestExpression of Interest (EOI)An Expression of Interest (EOI) is one of the initial transaction documents shared by the buyer with the seller in a potential M&A deal. The EOI indicates a serious interest from the buyer that their company would be interested to pay a certain valuation and acquire the seller’s company through a formal offer. is confidential and may not be disclosed other than to you, the Company and its advisors on a strictly need-to-know basis. It is not intended, and shall not be deemed, to create any binding obligation on the part of OUR NAME, or any of its affiliates, to engage in any transaction with the Company or to continue its consideration of any such transaction. Subject to the immediately following sentence, none of the parties shall be bound in any way in connection with this letter unless and until the parties execute a definitive agreement, and then shall be bound only in accordance with the terms of such agreement. Notwithstanding anything to the contrary in this letter, the Exclusivity and Confidentiality Agreement, once executed by the parties thereto, shall constitute binding obligations of the parties thereto. We are very excited about the potential opportunity and hope that you are equally interested in proceeding in a constructive and expeditious dialogue. We look forward to working with you to complete this transaction. Drafting a letter of intent (LOI) is an important skill for professionals in investment bankingInvestment Banking Career PathInvestment banking career guide - plan your IB career path. Learn about investment banking salaries, how to get hired, and what to do after a career in IB. The investment banking division (IBD) helps governments, corporations, and institutions raise capital and complete mergers and acquisitions (M&A). Analysts work 100, private equityPrivate Equity Career ProfilePrivate equity analysts & associates perform similar work as in investment banking. The job includes financial modeling, valuation, long hours & high pay. Private equity (PE) is a common career progression for investment bankers (IB). Analysts in IB often dream of “graduating” to the buy side,, and corporate developmentCorporate Development Career PathCorporate Development jobs include executing mergers, acquisitions, divestitures & capital raising in-house for a corporation. Corporate development ("corp dev") is responsible for executing mergers, acquisitions, divestitures and capital raising in-house for a corporation. Explore the career path..
To find out more check out our interactive Career Map.